Amazing, amazing blog. I’d massively appreciate a post clearly showcasing Japanese sonic adventure’s blurry feet top speed animation in motion rather than just an image. Against the egg hornet would be a good place to showcase it from the side. Love this site. Just read through everything; a fascinating read. The only thing that could move it from good to amazing is if a page were added somewhere that gathers together links to the mods such as the dc assets and lantern engine to make it easier to find. A “How to fix SADX on PC” section is coming soon! I really appreciate you taking the time to put this website together! I hope that someday SEGA decides to release Sonic Adventure with all of its original Dreamcast polish. I appreciate the effort and detail put into all of this, but it DOES always feel like there’s some sort of leaning bias towards the original. Emphasis on ‘feel like’, though, since often I can have trouble with this sort of thing, interpreting things wrong or letting them sail right over my head, combined with the reputation the Sonic fandom has in my head having a high likelihood of giving me a negative impression and thus tainting my judgement of this, like if going into a game expecting it to be horrible and so taking any flaws over the top whilst ignoring the game’s strengths. This is actually incorrect. The game renders internally at a different resolution, which is then properly stretched to 640×480 when being played on real hardware. Emulators are the ones that render it incorrectly, although this can be rectified in Dolphin by simply setting the aspect ratio to “Stretch to Window,” provided it’s at its default size. Interestingly, this leads to a rather funny screw-up: the GameCube version’s FMVs are 640×448, but they were cropped down rather than resized – thus, they’ll appear incorrectly on real hardware, correctly on emulators, and with a smaller viewing area in both. What an absolute disaster. 1) The Dolphin option you mentioned was used for all Gamecube footage on this blog. It does look better than the 4:3 option, but it doesn’t completely resolve the aspect ratio difference. Although the zoom is slightly different between pictures, you can see Sonic is noticeably taller in the left screenshot if you compare his head proportions. 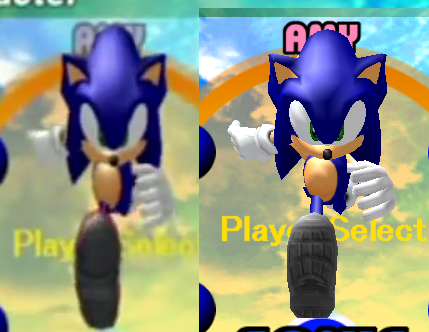 Here’s a screenshot comparison from Sonic Retro that also uses footage from actual hardware: http://www.sonicretro.org/wp-content/uploads/2017/02/sa_comparisson_character.png – same proportion difference as in the one above. You can also tell by the elongated letter A in Amy’s name. It appears that the game’s aspect ratio is technically incorrect but the TV or capture hardware may or may not stretch it to fit a standard sized picture. Internally the game is rendered at an incorrect aspect ratio, most definitely. This was very common for games of that era, both in order to give a softer look on out, and to potentially improve performance if only slightly. In the GameCube’s case, this scaling is not done on out, but is left up to the TV. Unfortunately, capture hardware and fixed pixel displays (EDTVs, HDTVs, etc.) do not properly handle this, whereas CRTs will take whatever they get and scale it to fit a proper 4:3 aspect ratio. Thus, any footage of the GameCube version of Sonic Adventure DX will not conform to the proper aspect ratio unless manually adjusted after the fact. I think I was wrong about Dolphin, though – the window’s resolution is not actually a proper 4:3 resolution either – when Stretch to Window is on, at the default size you’ll see a 620×480 picture. Additionally (I meant to mention this in my last reply,) whether 640×480 is even a 4:3 resolution by default can change depending on the kind of hardware you’re using, due to different displays having different pixel shapes. CRTs have rectangular pixel shapes, which are wider than they are tall, in comparison to fixed pixel displays, which uniformly have square pixels. Hey there. I wanted to use this blog to chip in a bit and say that the Gamecube version actually has the best quality opening of all versions (intro specifically, not the other FMVs). The only problem is that it uses the DX logo and both it and the Dreamcast versions are slightly cropped at the top and bottom, a problem that the PC version does not have. However, it also has a much lower bitrate than the Gamecube version so using it is not ideal. I’m telling all this because I have actually put together a version of the opening that combines all 3 versions to hopefully make a “definitive edition” of sorts. Using the GC version as the main video source, PC version to fill in the top and bottom cropped on the GC version, and the original logo in the DC version. I would like to know if I should post a link to my edit here or via email. I don’t know if you are still accepting updates for the conversion, but I thought I could help out in this area at least. I’m going to need some proof for this because I’ve compared the videos myself and found the 2004 PC version’s intro video to be the best. The Gamecube version’s video is also lower resolution – 640×448 vs 640×480, so it gets stretched by the game (at least on the emulator) to display properly. But it’s probably cropped like the Sonic Team logo video, in which case it could potentially compare in quality. I need to look into this. Nice that you made a combination though, I’d be interested to see it. Even better if you have the uncompressed video (or better yet, an archive with all video frames as BMP/PNG) – I’ve done a similar combination for the recent DC Branding update, where I combined footage from Dreamcast, PC 2004 and PS3/X360 intros, and my preferred method was splitting the videos into single frames using ffmpeg, combining frames and rebuilding the video from them. Alright, here’s a video link. It’s in a .7z file and is a lossless .avi. Okay, disregard my previous video link, it had color problems. This time I applied chroma smoothing in VirtualDub first and then rendered in Vegas. The comparisons look convincing, indeed the Gamecube version looks a lot better. It also seems that the quality difference is too noticeable to make combined frames, so I agree that it’s better to use the video as-is, especially if it doesn’t require stretching. I’m going to take a look at your edit soon, though I think I’ll probably make my own version of the whole thing. Anyway, thanks for bringing this to my attention. I will update the Miscellaneous page soon. Alright, thanks. Looking forward to your thoughts. did you correct the lighting that even dreamcast seemed odd with such as the lighting based on time of day thats used for indoor sections Or where they corrected with another mod ? That’s handled in the Lantern Engine mod by SonicFreak94. At the moment the lighting in those areas remains the same as in the Dreamcast version. The website is great, but could you not mention lighting IN EVERY SINGLE ARTICLE? It’s obvious that if the game engine lacks it, all the stages lack it. It would be nice to see actual differences in Action Stages/Adventure Fields pages. Why aren’t you putting a message about sound quality loss? And also, you said nothing about ZERO Boss in Bosses article. Are there really no differences (EXCEPT LIGHTING BUT IT’S OBVIOUS) or did you forget about it? I was thinking if I should bother replying to this comment at all, because the complaint makes little sense and the comment itself reeks of arrogance, but then I thought it might be useful for posterity, so here you go. First of all, there’s a separate section dedicated to sound and music quality downgrades in “General”. It wouldn’t make sense to discuss the sound quality loss in every level article because the majority of sounds are the same between levels, while textures and lighting are not (I do mention missing level-specific sounds though). Before this blog came to existence there was some guy trying to convince me SADX lighting wasn’t bad by demonstrating me videos from Emerald Coast and Red Mountain Act 1. The lighting system is broken in SADX, but depending on the level the differences can range from barely noticeable (Emerald Coast, Windy Valley) to extreme (Final Egg, Mystic Ruins base). This is why lighting is discussed and compared in all levels. Same for texture quality. If it’s OBVIOUS to you, this doesn’t automatically make it OBVIOUS to everyone else, and I’ve had some people say they didn’t understand the difference until they saw the side-by-side comparisons. In general, the downgrades in the port are very noticeable, but a lot of people thought it “wasn’t a big deal” until they read the blog. If everyone thought it was obvious, there wouldn’t even be need for this blog. I think you’re also missing the entire point of the blog, which is to discuss the specific differences between SA1 and SADX that can be considered downgrades. This is why there’s a strong emphasis on graphics, particularly lighting, special effects and textures – the areas where most of the original game’s charm was lost in the ports. For the purpose of this blog those are the “actual differences” to be discussed in level articles. I didn’t set out to make a general “SA1 and SADX differences” blog, so if you’re curious about different object placement or whatever, you’re looking in the wrong place. This blog is mainly aimed at a relatively small group of people who don’t know how or why the ports are vastly inferior to the original game. The ZERO boss fight uses the same arena as the E-101R fight, which 1) has already been discussed in the Bosses article, and 2) has the same downgrades as the Egg Carrier Exterior, so I didn’t feel like talking about it yet another time. There are some OBVIOUS LIGHTING differences with the level and Zero’s model, but you seem to be aware of that already. Also I think that glass reflection textures are better in DX. Though they’re less detailed, it’s better than having glass reflecting clouds and blue sky at night. SA1 has over a dozen of unique glass textures (Station Square has several unique reflections with further variations for day, evening and night, Speed Highway glass is different from Casino glass etc., the police cars in Chaos 0 have a different reflection compared to Speed Highway and Station Square cars etc. ), whereas in SADX most of these are replaced with one texture, often with the reflection effect toned down or disabled. Yet you pick out one single instance where one of the unique SA1 textures doesn’t fit well (which is mentioned in the blog too) and that is somehow enough to make the SADX glass reflection textures better. Smh. Would it be ok with you if I used some images from this blog to create a video showing off some of these downgrades? I’ll be providing my own images as much as possible along side them. Sure, it would help if you mention the blog in the video though. tcrf.net states that in the Dreamcast version of Emerald Coast, the water is attached to the skybox and moves with it. In the GameCube version, the water is rendered as fixed squares. Is it true? Is attached water implemented in DC_EmeraldCoast? He mentions that on the Emerald Coast page actually. The water is noticeably cut off before it reaches the skybox in the Gamecube version. Two questions, but might you intend to cover anything involving the core gameplay itself? I really hope I’m not going nuts with the collision, because from recently playing it on Steam–I experienced a lot of weird solid interactions, like somehow falling through the loop in Emerald Coast as Sonic, struggling to grab the car to enter the sewers as Big (like the collision generally wouldn’t let me get into proper position and/or hold the car)–in fact seems like I’m having a hard time trying to grab anything large, and again with Big… finding myself rotating around rapidly in Ice Cap Zone from touching walls. My other question is, will you in the near future, you’d cover in whatever was changed around in SA2? 1) The Emerald Coast loop problem happens in all versions of the game if you don’t hold forward while running through the loop, so it isn’t a problem introduced in SADX. The original game’s collision is quite terrible, but the question is – does SADX improve on it? And this is where it gets complicated because there’s conflicting evidence, but the fact that the loop glitch happens in SADX too doesn’t speak in its favor. 2) The collision system was reworked in SADX. The data structure used to store collision has additional fields in SADX, and in many levels collision was added or removed, or rearranged by editing the collision model’s polygon order. SADX also generally “prefers” cuboid collision, while SA1 uses a lot of spheres and cylinders. 3) When using model-based collision (as opposed to special collision data structures), SA1 models are technically compatible with the SADX collision system, but sometimes there are weird and inexplicable issues with them, like characters becoming able to stand on air in strange places, or not being able to walk smoothly on certain surfaces. 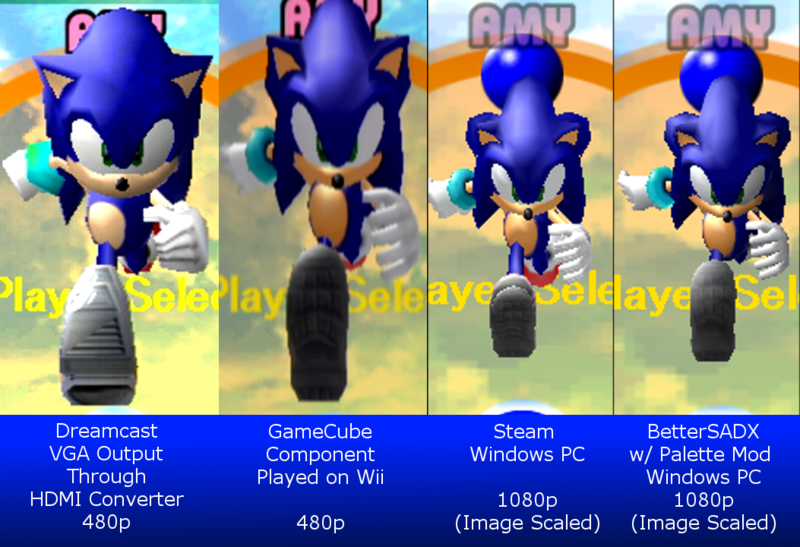 I ran into this while porting SA1 levels to SADX PC in my mods, particularly with Station Square. The SADX Preview prototype on the Gamecube (which retains DC level geometry in some areas) suffers from similar issues in the parts where level geometry hadn’t been updated yet – again, Station Square. 4) It’s easier to cause collision-related glitches in SADX. For example, in Windy Valley Act 1 it’s easier to make Sonic slide in place by jumping around the grassy bricks. It happens in the original game too, but not as often. This is one example I can remember off the top of my head, but there are several more. In addition, SADX has weaker (removed) collision in some areas, which causes issues such as Sonic falling to his death near the start of Final Egg 2 if you spindash backwards. The above are the factually true, and from there we can only speculate what the deal with SADX collision is. I’m inclined to believe that the widely accepted claim that “they tried to improve collision” in SADX is incorrect. To me it looks more like they couldn’t get the original game’s collision system to work properly on the Gamecube, and had to resort to some crappy workaround that resulted in all those collision differences. Note that this is just speculation, there’s currently no evidence to prove that it was indeed the case. On the other hand, I don’t see any evidence to the contrary either, because other than making a few areas solid SADX sure doesn’t “improve” much in the collision department. Regarding the plans for this blog, I intend to write another post on SADX extra content, such as Metal Sonic and Mission Mode. There’ll also be a “What went wrong” post, which will discuss some of the potential explanations on why SADX ended up the way it did (with clear separation of facts and speculation). The collision bits described above will most likely be used in that post too. As for SA2, SPEEPSHighway did some SA2/SA2B comparisons on her tumblr a while ago, so you might want to check those out. I’m not interested in SA2 at all, so this is for someone else to look into. This blog is quite interesting. I now appreciate SA1 a lot more due to the Dreamcast mods, though SADX GameCube was my first experience of Sonic Adventure. I like both versions, but Dreamcast on the graphics side, GameCube on the water distortion effect and Game Gear games. Glad to know you found it interesting! I’m planning to add a separate section on SA1 vs SADX water – I’ve been a bit harsh on the Gamecube version’s implementation of the water effect, so the separate page will be slightly less critical and more technical. I still think the Gamecube version’s distortion effect doesn’t fit in this game, particularly because it clashes with underwater texture animations that become much more difficult to see. The implementation is also flawed because it produces artifacts around things above water that aren’t supposed to be distorted, but they probably wouldn’t be able to do much better on the Gamecube even if they tried. I’m loving this conversation but, with the Final Egg conversation, there should be a goal capsule near the start of the level out of bounds. I figure that since you fixed/removed the SADX speedrun stuff, will you put the DC speedrun route back? The capsule was removed in SET layout fixes (which are now integrated into the main mod), there’s an option in config to disable SET fixes and revert to original Dreamcast layouts for all levels. The capsule is still there in original SET files. I see this in the default.ini “EnableSETFixes=Normal” and I know to put it in the config.ini. I don’t see anything in the customization.txt for it so I don’t know what to put there. Hey! Do you mean on making a version of this website focusing on the differences between the various versions of Sonic Adventure 2? Also, can somebody backport the DX Egg Carrier garden to Dreamcast Sonic Adventure? The original Dreamcast EC Garden is way too dangerous to playthrough IMO. Sorry, I’m not interested in Sonic Adventure 2. As for backporting the Egg Carrier garden from SADX into the Dreamcast version, it’s possible in theory but very tedious to do in practice, and I’m not sure why anyone would want to do that anyway. If I wanted to make custom levels and paths for SA1 DC, how would I do so? The dreamcast Station Square garden is fine, but I’d love a “best of both worlds” garden for both Mystic Ruins and the Egg Carrier…and I’d imagine that I’d have to either make it myself or learn how to do so and consider if I want to lol. Of course, it also makes me wonder if Japanese SA1 DC exclusive features like the “onion blur”, the Casinopolis cowboy girl, the higher quality music files, and the level select text (available on some but not all of the post JP 1.0 SA1 releases) could be brought to the US, EU, or JP “International” releases of SA1 DC. “…than the PC 2004 port of SADX could allow” was what I meant to say for that one sentence. Maybe I’m missing something, but that’s one of the biggest issues with the ports as it leads to problems which never existed or affected gameplay in less significant ways in the Dreamcast version. Collision is tricky to talk about in general because it’s wonky in both games, and a lot of issues found in SADX are also applicable to the Dreamcast original. I also wouldn’t call it a big issue because honestly the original game was already quite terrible at it. You can see my other comment regarding collision in my response to Aerylin Dracyl below (or above I guess). I think it might be worth pointing out that the page about the character model downgrades has a bit of outdated info, it mentions that the AutoDemo hi-res textures are available in the Dreamcast Character mod when they were removed from the mod a few months ago. It’s kinda nitpicky, but I hope you don’t mind me pointing it out! But just because a game’s buggy, doesn’t mean it isn’t fun, SA1 is a great example, SA1 was and is a buggy mess, as Sonic Team rushed the game to completion resulting in ALOT, of scrapped ideas. I’m not trying to defend SADX for what it is, i’m just saying the Dreamcast version is also buggy. This is the only comment on the blog so far that I would describe as “toxic”, so indeed maybe it’s time to rewrite the rules. People commenting here are generally pretty considerate, so there’s no need for that paragraph. From your message I can at least deduce that you’ve enjoyed the blog, which to me is all that matters. This was an amazing read. I remember picking up SADX for the PC years ago, and after playing it for a bit I unhappily dropped it, realising this was not the SA1 I remembered from my youth. I couldn’t really place why exactly, although the extra ‘content’ was the final straw for me. But this blog wonderfully put into words the dissatisfied feelings I had with SADX. Kudos, and thank you. Maybe you should make a sequel called GameCubeify where you list the upgrades in Sonic Adventure 2 Battle. About the character models. I’m really curious as to what a Sonic model with the DX polygons and the DC fur textures would look like. There was a mod like that before ItsEasyActually’s Dreamcast Characters mod came out. I think it was called “MimicDCTextures” or something along those lines.